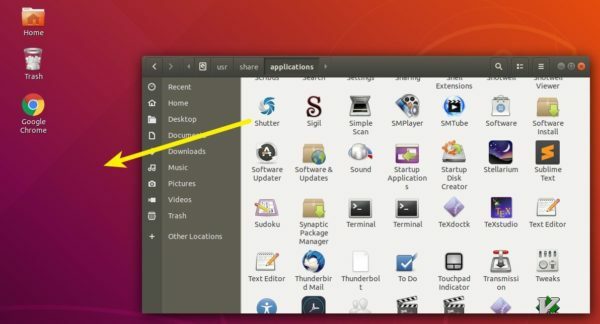 This quick tutorial is for those who want to pin application shortcut icons to the default Gnome Desktop in Ubuntu 18.04, while you can’t drag and drop icons from applications menu to the desktop. 1. First, open Gnome Tweaks (if not available, install it via Ubuntu Software) and navigate to Desktop tab and enable ‘Show icons’ on desktop. 2. Open Files (Nautilus file browser) and navigate to Other Locations -> Computer -> usr -> share -> applications. There drag and drop any application shortcut to the desktop. Click to run the desktop icon, and select ‘Trust and Launch’. The shortcut icon will display correctly once the application launches. To remove a desktop shortcut, simply move the icon to trash. Only the shortcut will be removed, not the original item. is it really shortcut or app copy ? It’s a shortcut. You can see it by looking at their Properties, they are “desktop configuration files”. If we talk security here, this feature is a joke, isn’t it? Microsoft was doing the same in the 2000s. Wasted 30 min to make a shortcut, in 2019. Great work, Ubuntu! Gnome Tweaks! Is It available for Ubuntu 16.04?